Polished and classic, this yellow table lamp crafted of iron has a cylindrical stem supported by a rectangular base and an imposing rectangular shade containing the light source. The notable element of this sculptural piece is the horizontal position of the light bulb, making it possible to see the light source only from below or from a narrow angle above. Minimalist and elegant, this table lamp's unique finish is obtained by hand-applying the color in layers and then subsequently sanding, brushing, and polishing the surface to create a soft texture and less dramatic chromatic effect. 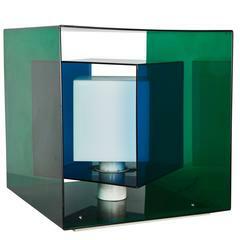 Table lamp by Costantino Corsini & Giorgio Wiskemann for Stilnovo. Table lamp, designed and manufactured by Fase Spain. It features a lacquered metal structure and shade. In a good vintage condition, though the diffuser glass is missing. 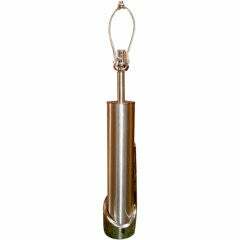 Steel and brass single table lamp by Laurel. 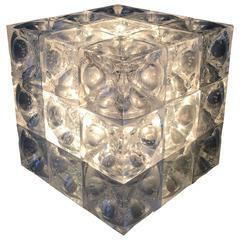 Composition including 27 cubed unrefined glass component parts with an internal hemispheric groove. One internal lightbulb. Max. 100watts. Table Lamp by G. Bartolucci. Designed and manufactured in Italy circa 1970s. Wood, metal wire. Wooden hand switch. Takes one E14 European candelabra. Retains original makers mark.